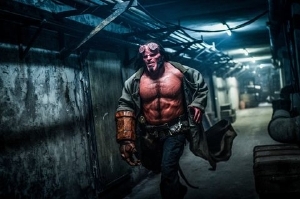 I'm such a huge fan of Neil Marshall that I can't help but wish he was doing an original film, but if there was any comic book property that fits his R-rated sensibilities than it's probably Hellboy. Yes, there is some controversy with the fact that Del Toro didn't come back and Ron Perlman isn't playing the titular character, but Stranger Things' David Harbour does seem like a great fit if it has to be anyone else in the role. So, I feel like it all evens out in the wash for fans... as long as the film ends up being good. Hellboy stars David Harbour, Milla Jovovich and Ian McShane. Hellboy arrives in theaters on April 12, 2019. Still looks like a comedy, regardless of the amount of profanity or gore in the film, it seems to be done for laughs.